187 backers pledged $66,420 to help bring this project to life. PLEN2 is a robot kit consisting control boards, servomotors and accessories that you can put together yourself. You do not need any technical knowledge and special tools. What you need to build this robot is just a screwdriver. When you complete it, PLEN2 is approx.7.87in tall and weighs approx.21.16ozwith 18 joints and it is highly maneuverable. 3D data for the main components of the robot are provided at free of charge.Thus, using a 3D printer, anyone can customize the data and make their own original parts. The control board of PLEN2 is an Arduino compatible control. Gadget lovers can easily do some programming and add function to PLEN2. Control board for ROS MiddleWare　are also lined up. Technical experts and researchers will be able to conduct fully-fledged robot development. – PLEN2 is carrying small thing, dancing, and playing football with fellows.PLENs can get together and have all sorts of borderless fun. – You can operate it with your smartphone, PC, and other input methods by sensor devices such as body motions, facial expressions, myogenic signals, brain waves, etc. – Children can experience the joy of making things themselves whilst learning about the robot’s construction. Children can learn robot with their way. – Students and grown-ups have the opportunity to learn about programming, machine control, electronic circuits, and design. – Researchers, engineers and developers can use PLEN2 to perform lots of other helpful functions such as sending images and fetching objects from places they cannot see or get to themselves. Our aim is to open up the relationship between humans and technology through printable and open-source robot kit, ”PLEN2”. We do not believe that robots should replace people but that they should complement our abilities. We strongly believe that scientific technology can enrich everyone in society, if we embrace it in a positive manner. We are very small team. Thus, we need your help to build PLEN2, bring it to the world, and to grow the community. 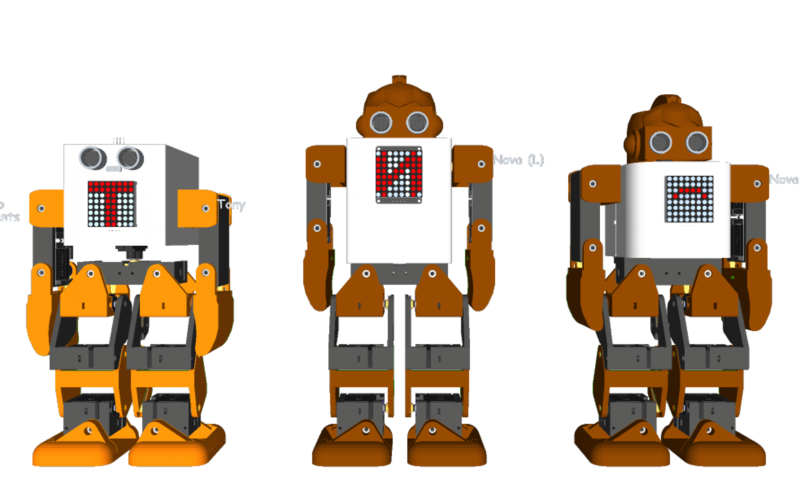 Please support us in our goal for a tomorrow where everyone can make his/her own humanoid robot. Let’s humanize technology! The Head Board of Developer Edition will have Edison. I am the CEO and Founder of PLEN Project Company responsible for technology, R&D, and production. I have been engaged in the education of robotics for more than 10 years. I established the department of Robotics at a technical college in Japan 4 years ago and have also held robotics workshop for school children every month. I believe that better understanding of robot makes better relationship between robot and humans. Naohiro is a pioneer of robots and experienced technical executive. He has more than 11 years of experience on software development and electronic design, and has more than 6 years of experience on processor design with FPGA (field-programmable gate array). He has developed countless number of robots, home sensor systems and Brain Machine systems since 2004. His prime interest is to develop pocket-sized robots and to take humans to Mars together with those robots. As a financial engineer and trader, Atsuhiko was in investment banking business for 15 years and has now jumped into the world of robotics. As a manager of PLEN Project Company, his role is to lead our sales & marketing and financing efforts both in the US and in Japan. Ryota is Founder & CEO of Kibidango, Inc. Headquartered in Japan, Kibidango has been working with us as a partner to help launch our crowdfunding project to the world through Kickstarter and Kibidango, a leading crowdfunding platform in Japan. February 2014: PLEN2 Development Project started. March 2014: Mechanical design and control board prototyping completed. September 2014: User test for printable robot at ARS ELECTRONICA’s workshop held. November 2014: Prototype tests for control boards completed. December 2014: Apps development for iOS and Android started. March 15, 2015: Launched our Kickstarter! April 2015: Finish design for the trial product for the mechanical parts. May 2015: Complete Alpha version of iOS and Android apps. June 2015: Receive trial products for mass production. Complete Beta version of iOS and Android apps. Start mass production of the control boards. August 2015: Start mass production for the mechanical parts. September 2015: Release iOS and Android Apps. Receive all mechanical parts. November 2015: PLEN2 starts shipping! We have identified some risks to manufacture and deliver our new product. Here are some of the risks that we see and we’re confident that we can control them. COMPONENT PRICE CHANGES: Since we use lots of different vendors for many different components of the product, there is always a risk that one or more vendors change their prices along the way due to various reasons like currency fluctuations, salary demands, etc. On the other hand, we don’t want to increase the final product cost as we’ve already committed to the price with our backers. To minimize this risk, we have 2 or more vendors per key component, so that if we have pricing issue with one vendor, we can work with the back-up vendors. PRODUCT ADJUSTMENTS: There will likely be some adjustments to the final product which could happen during mass-production. To minimize this, we’ll have a well-defined specs. Having 2 or 3 perfectly working prototypes prior to production. Test products earlier to find potential issues early in the production lifecycle. MANUFACTURING: Tooling is always expensive and hard to get it right the first time for a product of this complexity. It could take a few iterations and anywhere from 30-90 days to get it right. To minimize this year, we’ll have a clear, well-defined specs and requirements. Only work with tooling subcontractors with a proven track record. Be at their facility every day in person to work with their team until we get it right. Company scale up: Now PLEN Project Company has only 3 permanent members. To scale up our company with sustainable way is going to be a big challenge. To achieve the successful scale-up, we have already started recruiting talented people globally.